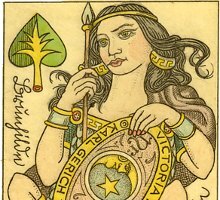 “Nibelungenkarten”, or “Siegfried”, is a 32-card German suited pack produced by Karl Gerich in 1994, (although started in 1989 when trading as “Victoria P.C.C.”). The courts are characters from Wagner's opera “The Ring of the Nibelungs”, beautifully etched and hand coloured. Each character is named in a cursive script along each side of the card. The cards measure 60mm x 95mm and a total of some twenty packs have been made. Above: cards from No.27 in the catalogue, “Siegfried”, a beautiful hand drawn and coloured pack produced by Karl Gerich in 1994. 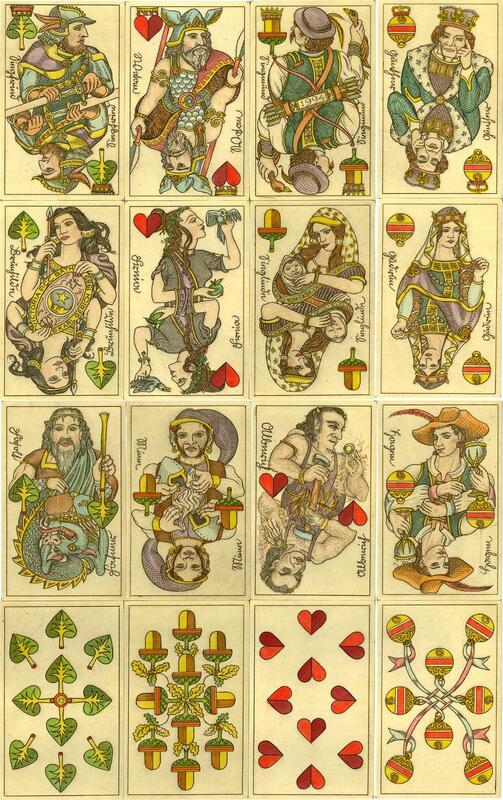 The suit symbols are leaf, bell, acorn and heart; the court cards are named characters from Wagner's opera. 32 cards; 95mm x 60 mm. Images courtesy Barney Townshend.